Out of 68 Million, almost 32 Million passwords are secured using the strong hashing function "BCrypt," making difficult for hackers to obtain users’ actual passwords, while the rest of the passwords are hashed with the SHA-1 hashing algorithm. "We’ve confirmed that the proactive password reset we completed last week covered all potentially impacted users," said Patrick Heim, Head of Trust and Security for Dropbox. "We initiated this reset as a precautionary measure so that the old passwords from prior to mid-2012 can’t be used to improperly access Dropbox accounts. We still encourage users to reset passwords on other services if they suspect they may have reused their Dropbox password." Dropbox initially disclosed the data breach in 2012, notifying users that one of its employee passwords was acquired and used to access a file with users’ email addresses, but the company didn’t disclose that the hackers were able to pilfer passwords too. 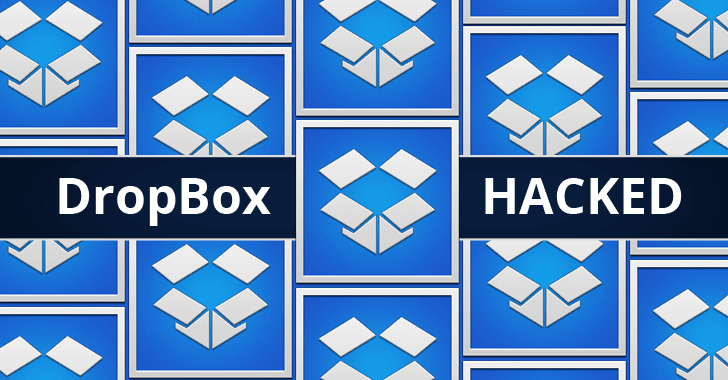 But earlier this week, Dropbox sent out emails alerting its users that a large chunk of its users’ credentials was obtained in 2012 data breach that may soon be seen on the Dark Web marketplace, prompting them to change their password if they hadn’t changed since mid-2012. "Our security teams are always watching out for new threats to our users. As part of these ongoing efforts, we learned about an old set of Dropbox user credentials (email addresses plus hashed and salted passwords) that we believe were obtained in 2012," the company wrote. "Our analysis suggests that the credentials relate to an incident we disclosed around that time." Dropbox is the latest to join the list of "Mega-Breaches," that revealed this summer, when hundreds of Millions of online credentials from years-old data breaches on popular social network sites, including LinkedIn, MySpace, VK.com and Tumblr, were sold on Dark Web.